If all of your teeth are lost or have been extracted, your body resorbs the minerals from the bone that used to support the teeth. Those minerals are used elsewhere, but the loss from the jawbone causes it to shrink very slowly, over the course of ten to twenty years. Eventually, the bone loss can become debilitating. Facial collapse can get so bad that it may become impossible to comfortably wear a denture. An individual that suffers from facial collapse will appear much older than they really are because the face takes on a sunken-in look. Painful sores can develop from trying to wear a denture over a smaller and smaller jawbone. Eventually the jaw will not be able to support a denture. Not only does this condition result in negative health impacts because of inevitable diet restrictions, but it can be seriously damaging to the individual’s self esteem. The denture will become increasingly loose and may fall out at embarrassing times. Sadly, some people feel so humiliated that they avoid social situations altogether. In the illustration, there are a series of models that represent the progression of bone loss over a period of about ten years. A full set of healthy teeth is depicted in the top model. Then, in the second model the teeth are gone. In the first month, there is significant bone loss and then it slows down to a very gradual decline over the years. In the bottom model, the jaw has experienced extensive bone loss and there is very little bone ridge left. In fact, the individual depicted in the bottom image has experienced so much bone resorption it is likely that they are considered a dental cripple. Dental implants prevent facial collapse. The surgical post that is implanted directly into the jawbone sends what is called a piezoelectric signal to the bone to prevent it from being resorbed. Essentially, the implant is telling the body that the bone is still needed to support the teeth. Two, four, or six dental implants per arch can not only increase the stability and functionality of your denture, but they can also prevent facial collapse. For every dental implant that is placed, the bone immediately surrounding the implant and near to it will be preserved. Please visit our dental implants page to learn more about the many benefits of this treatment. If you or someone you know is already suffering from this devastating condition, the good news is that Dr. Coleman can still help. Bone grafting surgery can provide adequate bone at the implant site. Dr. Coleman has strong implant credentials. He is a recognized as a Fellow of the International Congress of Oral Implantologists and has been successfully performing the surgical and restorative phases for decades. If you would like more information in a comfortable setting, we are here to help. 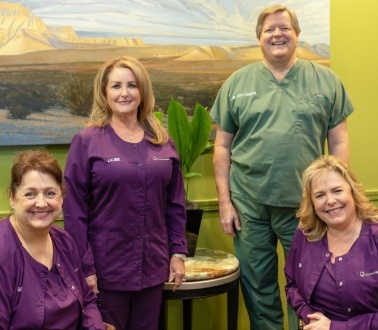 Give us a call today at 713-783-2800 to schedule an implant consultation with Dr. Coleman.